Habit: Annual to shrub, +- woolly. Leaf: generally alternate, proximal sometimes opposite, entire to nearly compound. Inflorescence: heads 1--many, generally radiate; often in +- flat-topped clusters; involucre obconic to hemispheric; phyllaries 4--13(15) in 1 series, free or +- fused; receptacle flat to columnar, smooth or pitted (occasionally 1--6 palea-like scales at tip). Ray Flower: 0 or generally +- 1 per phyllary; ray entire to lobed, generally yellow (white). Disk Flower: (3)10--300; corolla yellow; anther tip ovate, deltate or awl-shaped; style tips +- ovate, papillate. Fruit: 4(5)-angled or outer fruits flattened, inner fruits generally club-shaped; pappus of 0--15 +- jagged or fringed scales. Species In Genus: 13 species: western North America. Etymology: (Greek: woolly leaf) Note: Eriophyllum nevinii moved to Constancea. Habit: Annual 1--15 cm, often tufted, woolly. Leaf: 7--20 mm, spoon-shaped to obovate, entire or 3-lobed. 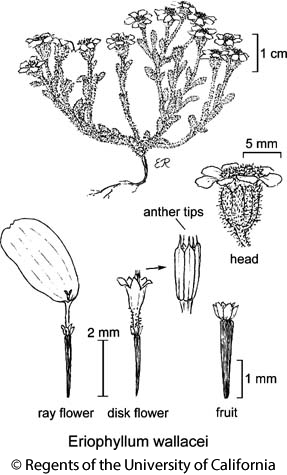 Inflorescence: head 1; peduncle 1--3 cm; involucre 5--7 mm, bell-shaped; phyllaries 5--10, acute, free; receptacle hemispheric. Ray Flower: 5--10; ray 3--4 mm, yellow, occasionally cream-white. Disk Flower: many; corolla 2--3 mm, throat minutely puberulent; anther tip awl-like, glabrous. Fruit: +- 2 mm, narrowly club-shaped, glabrous or minutely strigose; pappus (0)0.4--0.8 mm. Chromosomes: 2n=10+0--1I or 0--3B. Citation for this treatment: John S. Mooring & Dale E. Johnson (annual species) 2012, Eriophyllum wallacei, in Jepson Flora Project (eds.) Jepson eFlora, http://ucjeps.berkeley.edu/eflora/eflora_display.php?tid=1073, accessed on April 21, 2019.
e SnFrB, SnGb, SnBr, PR, SNE, D; Markers link to CCH specimen records. Yellow markers indicate records that may provide evidence for eFlora range revision or may have georeferencing or identification issues. Purple markers indicate specimens collected from a garden, greenhouse, or other non-wild location.